Quality construction equipment can save a contractor both time and money, as it will reduce dollars spent on repairs, and the money lost due to lower productivity and machine rental costs – not to mention the time spent on coordinating repairs, obtaining replacement equipment and shifting jobs as a result of broken machines. Ultimately, a quality piece of equipment will lead to better performance and a happy, repeat customer. Below is a list of suggestions to get the best life out of your small engine. But how does one determine quality? A critical component of overall equipment performance is the engine. Because the engine plays an important role in the life of equipment, the right combination of engine and equipment is critical. Be sure to consider the following top five appropriate criteria when evaluating an engine. One of the most important engine considerations is a good air cleaner. An efficient air cleaner will prevent dirt from entering the engine, reducing wear on the valves and rings. Dirt allowed into the engine will also get into the oil and cause additional wear on the connecting rod and crankshaft. An air cleaner with a dual element and small micron size will help to ensure optimum protection against dirt. A dust-proof carburetor is also essential. A sealed carburetor that prevents dust from entering reduces damage that may be caused by a clogged air cleaner. Should the air cleaner become clogged, a sealed carburetor design becomes a must-have, back-up defense mechanism to prevent the damaging effects of dust. Without seals in place, dirt will get sucked through the gaps between the choke shaft and throttle shaft, and increase wear on carburetor and engine components. Another important feature is a cast iron cylinder liner. Most outdoor power equipment engine blocks are made from aluminum, a very soft material in contrast to the steel or chrome rings on the pistons. This variation in hardness causes the piston rings to quickly wear away the aluminum cylinder walls. As the cylinder walls wear down, compression is lost and, ultimately, the engine no longer produces enough power to properly run the equipment. Because cast iron is much harder than aluminum, cylinders with a cast iron lining wear much better in combination with the piston rings, leading to increased engine life. Steel alloy components are another aspect to consider. Engines with items such as cam gears and cams made with cast iron last longer because the wear characteristics are much better than those of engines made with plastic components. Ball bearing support of the crankshaft is also important. Because the ball bearings reduce friction, the power delivered to the crankshaft is increased. Finally, an engine should have a low oil sensor. If an operator allows the oil to drop below a safe range, a low oil sensor will ground out the ignition and stop the engine before damage occurs. This can be vital, especially for busy contractors who often overlook basic maintenance items like checking the oil. If you need small engine parts or need to look at engine and equipment parts breakdowns, please click here. 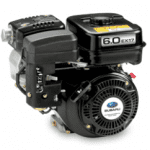 If you need service on small engines, please click here.